Julia Roberts is having a bit of trouble at the box office these days, but 25 years ago, the actress with the megawatt smile and even more captivating laugh was pure gold. At just 23, the Smyrna, Ga., native was Hollywood’s most bankable star, with Pretty Woman, Steel Magnolias, and Sleeping With the Enemy under her belt. More interesting — and dramatic — than her meteoric rise to fame, though, was her love life. On this day 25 years ago, the Hollywood “it” girl, who already had a romance with Liam Neeson and a broken engagement to Dylan McDermott under her belt, was supposed to marry her Flatliners co-star Kiefer Sutherland, who was one year her senior. But as preparations were underway at the wedding venue — 20th Century Fox’s Soundstage 14, which was being decorated like a garden paradise — for a June 14, 1991, wedding, Roberts became a real-life Runaway Bride, years before she starred in a film of the same name. 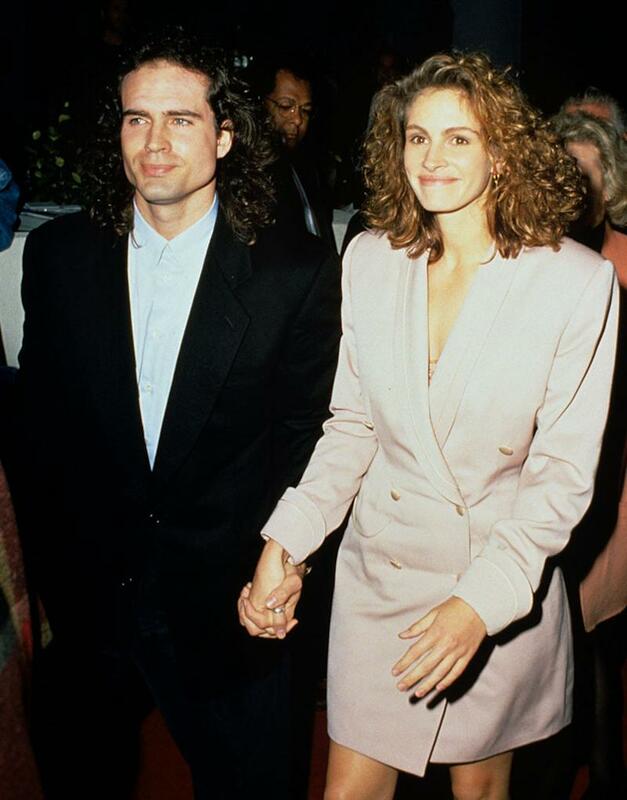 She ran off with her fiancé’s friend, Jason Patric. Love blossomed for Roberts and Sutherland on the set of 1990’s Flatliners, a very romantic film about med students who briefly kill themselves and bring themselves back to life in order to explore the afterlife. She broke off her engagement to McDermott, who played her hubby in Steel Magnolias, to be with the bad boy, a Hollywood scion whose own body of work included hits like The Lost Boys, Stand By Me, and Young Guns. He was still married to his first wife, Camelia Kath; his divorce became final in early 1990. In January of that year, Julia won the Best Supporting Actress Golden Globe for Steel Magnolias. In her acceptance speech, Julia, rocking trendy menswear, thanked her “best friend — my beautiful blue-eyed, green-eyed best friend, who gives me everything,” obviously referring to Sutherland, who has two different-colored eyes. Their relationship was volatile — they were in their early 20s! — and it was documented in People magazine, which was really the only game in town then. “Hollywood’s reigning couple,” which is how the mag described them, moved into Julia’s million-dollar Hollywood Hills home. By 1991, however, they were having trouble. Kiefer, who has a well-documented history of liking the drink (see: Kiefer Sutherland Tackles the Christmas Tree), moved out of Julia’s home and into a seedy hotel (which cost $105 a week!) across the street from his favorite Hollywood billiards parlor in February. While living there, Kiefer, who claimed to be doing research for a role (just like Winona Ryder’s shoplifting excuse), kept company with a 24-year-old go-go dancer named Amanda Rice, who performed under the name Raven. A few weeks later, Kiefer moved out of the hotel and back into Julia’s house. Things seemed fine until three months after that, when Rice sold her story to a tabloid, saying Kiefer told her that Pretty Woman turned Julia into an insecure “ice princess.” A rep for Kiefer denied that the relationship with the stripper was romantic. Meanwhile, Julia checked into Cedars-Sinai Medical Center for “the flu” — and stayed five days. Kiefer visited often. She was soon spotted wearing an engagement ring. While Julia had her bridal shower, thrown by Goldsmith, at which there were “lots of lacy underthings for the glowing bride-to-be,” Kiefer’s June 11 stag party was called off. “The staff at Dominick’s restaurant, where Kiefer’s bachelor party had been hastily canceled, feasted on the cake that had been ordered for dessert. It was an exact replica of a 15-pound roast turkey. ‘Kiefer has a thing for turkeys,’” said a source at the time. Apparently. The day the wedding was to take place, Kiefer moved out of Julia’s house and into his own apartment. According to the mag, he learned about their wedding being called off not from Julia, but from a mutual friend who called him with the news. So how did Julia spend their wedding day? Having a turkey burger with Jason Patric. Julia was linked to Jackie Gleason’s actor grandson prior to her romance with Kiefer. Jason, who co-starred with Kiefer in The Lost Boys and developed a friendship with him, appeared to be back in the picture on June 9 when he arrived at the Canyon Ranch Spa in Tucson, where Julia was with friends, and seen comforting her. Instead of heading to Whitefish, Mont., where she was to honeymoon with Kiefer at his 300-acre ranch, she and Jason — who had initially been invited to the wedding but was uninvited by Kiefer as the date drew near — jetted off to Ireland. The press couldn’t get enough, with one especially salacious report in the London Daily Mail claiming that they were “practically making love” on their flight. The paparazzi and press that followed them to Ireland followed them back home again — and all over the U.S. when they returned. The hunted couple went public with their romance later that year, but ultimately called things off in 1992. Julia, now 48, went on to a short-lived marriage with Lyle Lovett in 1993, but really, truly settled down with now-husband cameraman Danny Moder — with whom she shares three children — after tying the knot in a surprise ceremony on July 4, 2002. The 24 star, who’s now trying out a second career as a country singer, tried marriage again in 1996 (with Kelly Winn), but it didn’t pan out. Since then, he’s had several long-term romances. At that point, he hadn’t seen Julia since their split, though he had said earlier he would be open to working with her again — with many conditions. “If the script was right, if the opportunity was right, and if everybody involved wanted to do it in the first place, sure. I think she’s an extraordinary actor,” he told Bay Area HQ. As for whether he had forgiven Jason, “It’s not a matter of that,” Kiefer, now 49, told Rolling Stone. “We were friends, and I’m surprised that I never got a call from him saying I’ve fallen in love with da-da-da. Instead, I found out from a stranger.” In 2012, Kiefer and Jason starred on Broadway together in That Championship Season. They are fine — but oh, what a moment in time.